Disclaimer: I was sent this beers to sample by the Craft Dan brewery. The opinions contained below are my own honest assessment of these beers. It seems that the British craft brewing scene is in full-swing. At many pubs around the country it is possible to find many beers both in keg and in bottle from small-scale producers, beers that have plenty of character and flavour and, in my humble opinion, a much better taste than the big-name dross that tend to be on the taps. Crafty Dan micro-brewery is an off-shoot of the Thwaites' brewery where they look to supplement their normal Cask and Keg beers that they produce with small-batch production of bottled beer. The micro-brewery has a capacity of 20 barrels for production. The concept is to look for ways to experiment, I suppose they can then see what works and gets good feedback for maybe a larger scale production. 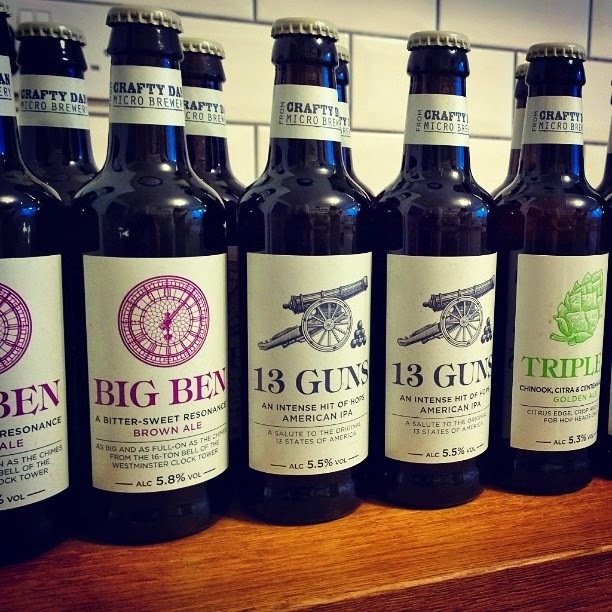 I was sent a case of Crafty Dan's three latest bottled offerings: 13 Guns, Triple C and Big Ben. What stood out for me in these beers was the use of varied hops and malts in these beers to produce an array of flavours and styles of beer. Triple C (made with Chinook, Citra and Centennial hops [hence the Triple C moniker!]) is a golden, hoppy ale, which was fresh, bright, crisp and dry. It had a slightly sour, citrus flavour. This would be a pleasant mid-afternoon, sipping-in-the-park beer. 13 Guns (made with Centenniel, Citra, Amarillo, Apollo, Chinook and Kohatu hops) is an American-style IPA (13 being a nod-of-the-head to the number of original states in America), which was certainly browner in the glass than the Triple C. It had a slightly fruity note to it, which was then overtaken by a malty and slightly treacly taste. This would be a good pub beer; plenty of taste and style, but easy enough to drink. Big Ben (made with Fuggles, Goldings, Challenger, Citra, Chinook and Summit hops) is a full-bodied brown ale, which claims to be "as big and full-on as the chimes from the 16-ton bell of the Westminster Clock Tower". This was a dark-red/brown ale, which had a more pronounced malty smell. There was no fruit on the mouth (unlike the others), but it had a distinctive sweet finish instead. I used this ale in a steak and ale pie filling that I made and it worked very well. So, what can I say? If Crafty Dan were looking for beers that would be a hit, I think they have found some. I would be happily order these in a pub. Keep on brewing! Their beers aren't widely available at the moment, but you can buy these and more Crafty Dan beers from Best of British Beer for £14.75 per case of 8, or from £1.95 each. Wine for Beginners: Torrontés - "I like it a lot"
World Cup Dream Team of Booze! Girl Chat: Tea not Football. Summer Iced Teas.